From July 6 to July 7, Prime Minister Voreqe Bainimarama toured Kadavu and officiated in several Government projects including the opening of the Kadavu Road Show. 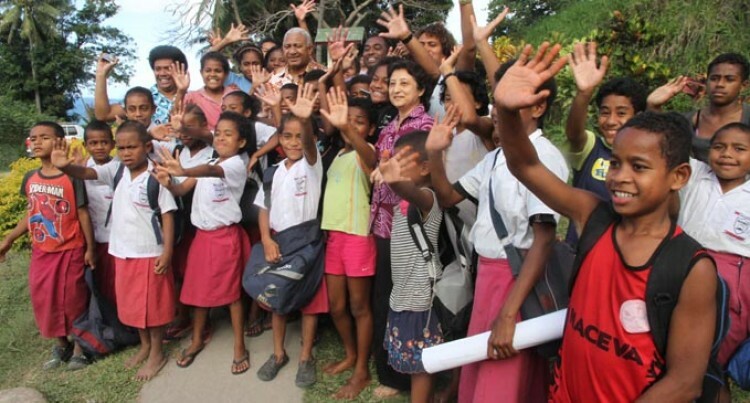 Vunisea Secondary School, Richmond High School, Nabukelevu District School were fortunate enough to have Mr Bainimarama open projects to help the students. At Vunisea Secondary school, Mr Bainimarama opened the boys’ dormitory, which was refurbished with new beddings and double bunks. The school was also boosted with a new library, computers and internet services. A footpath was constructed from the main school building to the dormitories worth $100,000. A new ablution block was built for the students of Nabukelevu District School costing $40,000 and a $10,000 school library upgrade. At Richmond High School, the PM opened a new library and a computer centre. The school also received dozens of solar panels for electrification, a 75 horsepower outboard engine and a generator. The solar panels will give the students and teachers the freedom to work with any electrical gadget, 24/7, as enjoyed by their counterparts in urban schools. The project was worth $31,000. Meanwhile $16,000 was donated by the old scholars of the school now living in overseas. The students of both schools were happy that this Government also recognised them. Richmond High School bursar Vasemaca Sorovi said: “Today, I am just a switch away from everything that took me a day to complete. “I thank the PM, who made a promise and fulfilled it within a short period of time. The children, she said, now had access to the internet and no longer had to use lanterns during those dark nights.